Isn’t it weird when vegan food winds up smelling or tasting exactly like the omni food it’s trying to imitate? It can be kind of disgusting depending on the dish, but sometimes it’s just entertaining. 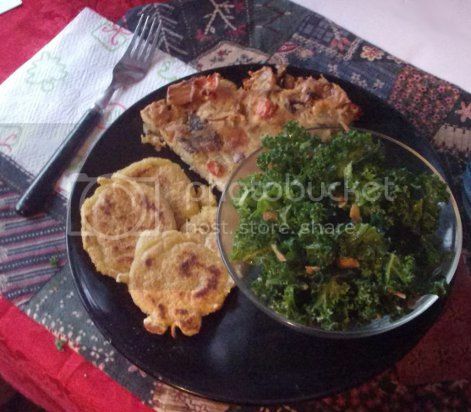 Such was the case with the roasted vegetable frittata from 1,000 Vegan Recipes. The first thing I noticed about it when it was cooking was the unmistakable smell of eggs. How that happened with a combination of blended seasoned tofu and roasted veggies, I’m not sure, but it was definitely odd! I never made regular frittata before, but I had the vegan version once at X’s to O’s and loved it. In fact, the dinner menu I built around it was inspired by the tasty combinations that pop up there on brunch weekends. I’ve always had a lot of fun with making breakfast for dinner, and this was no exception. At first I wasn’t sure what to make for side dishes. 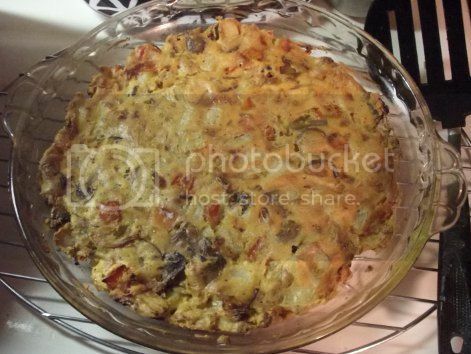 The frittata already had potatoes in it, so some kind of potatoes or hash browns seemed redundant. But lo and behold, a few pages on from the frittata recipe in the same cookbook was a recipe for Johnnycakes! Which I had also never made. And it turns out I was hugely remiss in this, because they’re not only so easy that I could make them in my sleep, they’re also really good. Being basically pan-fried polenta cakes, they taste predominantly of corn. So when you put maple syrup on them, they taste like Corn Pops cereal! Only without that weird packing peanut texture. Mom and I loved this dinner. It was easy, it was delicious and I’d make it again in a heartbeat! Even if the kitchen did still smell like eggs the next morning. Question for the comments: What vegan dishes have you made that turned out eerily similar to their omni counterparts? Recipe: Curried Lentil, Butternut & Greens Saute — Roasted Veggie Goodness!